William Henry Harrison Autograph Signed as President Costs a Fortune! William Henry Harrison took the oath of office on March 4, 1841, a cold and wet day. He wore neither an overcoat nor hat, rode on horseback to the ceremony rather than in the closed carriage that had been offered him, and delivered the longest inaugural address in American history. At 8,445 words, it took him nearly two hours to read, although his friend and fellow Whig Daniel Webster had edited it for length. Harrison then rode through the streets in the inaugural parade, and that evening attended three inaugural balls. On March 26, Harrison became ill with a cold. According to the prevailing medical misconception of that time, it was believed that his illness was directly caused by the bad weather at his inauguration; however, Harrison’s illness did not arise until more than three weeks after the event. Harrison’s doctors tried cures, applying opium, castor oil, leeches, and Virginia snakeweed. But the treatments only made Harrison worse, and he became delirious. He died nine days after becoming ill, at 12:30 a.m. on April 4, 1841, of right lower lobe pneumonia, jaundice, and overwhelming septicemia. William Henry Harrison full four-language ship’s paper signed as President, undated though of course sometime between 4 March and 4 April 1841. Countersigned by Daniel Webster as Secretary of State. 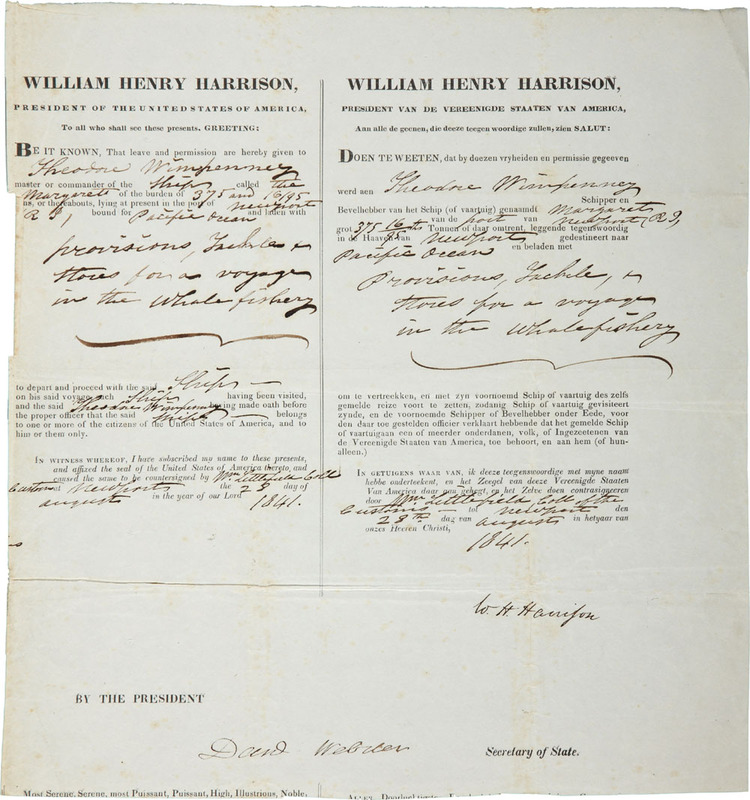 Having only served one month in office before dying of complications from a cold, documents signed by Harrison as President are exceptionally scarce. In fact, only 24 Harrison presidential documents (twelve in private hands and twelve in institutions), three presidential autograph letters signed, and two presidential manuscript letters signed are known to exist, with many of the examples simply being his clipped signature with “President” printed beneath. This document, an exceptionally well-preserved four-language ship’s paper is boldly signed “W.H. Harrison” to the mid-right section. It was customary at the time for Presidents and the cabinet to sign ship’s papers in advance of their use for the convenience of the local officials who gave them to American merchant vessels bound overseas. This document is no exception, as portions were left blank. Printed in French, Spanish, English and Dutch, the English portion reads in part: “William Henry Harrison, President of the United States of America, To all who shall see these presents…By the President / Most Serene, Serene, Most Puissant, Puissant, High, Illustrious, Noble, Honorable, Venerable, Wise, and Prudent Lords, Emperors, Kings, Republics, Princes, Dukes, Earls, Barons, Lords, Burgomasters, Schepens, Counsellors, as also Judges, Officers, Justiciaries, and Regents of all the good cities and places, whether Ecclesiastical or Secular, who shall see these patents or hear them read: We [blank] make known, that the master of [blank] appearing before us, has declared, upon oath, that the vessel called [blank] of the burden of about [blank] tons, which he at present navigates, is of the United States of America, and that no subjects of the present belligerent Powers have any part or portion therein, directly or indirectly, so my God Almighty help him [blank] And, as we wish to see the said master prosper in his lawful affairs, or our prayer is, to all the beforementioned, and to each of them separately, where the said master shall arrive with his vessel and cargo, that they may please to receive the said master with goodness, and to treat him in a becoming manner, permitting him, on paying the usual tolls and expenses in passing and repassing, to pass, navigate, and frequent the ports, passes, and territories, to the end to transact his business, where and in what manner he shall judge proper.” Harrison signs his name, “W.H. Harrison” boldly and clearly on the fourth panel, the Dutch portion of the document. Webster signs his name “Daniel Webster”, also boldly and clearly, beside the printed “Secretary of State.” portion. Document measures 21.5″ x 16.5″ with neat mends to horizontal fold. Minor browning in a few spots and creasing around the original blind stamped U.S. seal still intact. An exceptionally scarce document in very good condition. 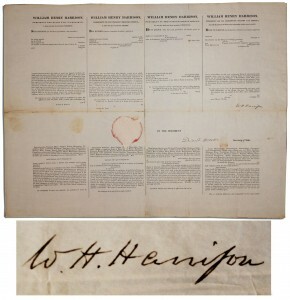 This William Henry Harrison Autograph Document Signed as President sold for $75,000 privately in 2011. These can sell for as high as $150,000. 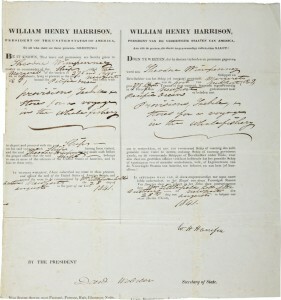 William Henry Harrison partial ship’s paper signed as President, printed in English and Dutch. Countersigned by Daniel Webster as Secretary of State and by William Littlefield as Customs Collector. Having only served one month in office before dying of complications from a cold, documents signed by Harrison as President are exceptionally scarce. In fact, only 24 Harrison presidential documents (twelve in private hands and twelve in institutions), three presidential autograph letters signed, and two presidential manuscript letters signed are known to exist. This ship’s paper is partially trimmed and measures 10.5″ x 11 from the port of Newport, Rhode Island, dated 28 August 1841 approximately five months after Harrison’s death; it was customary at the time for Presidents and the cabinet to sign documents such as this in advance of their use. Document was issued to Theodore Wimpenney, master of the ship Margaret, noting that she carried “375 and 16/95 tons, or thereabouts, lying at present in the port of Newport, RI, bound for Pacific Ocean and laden with provisions, Tackle & stores for a voyage in the whale fishery.” Document is bright and clean, with two tiny tears at left center edge. Exceptional. 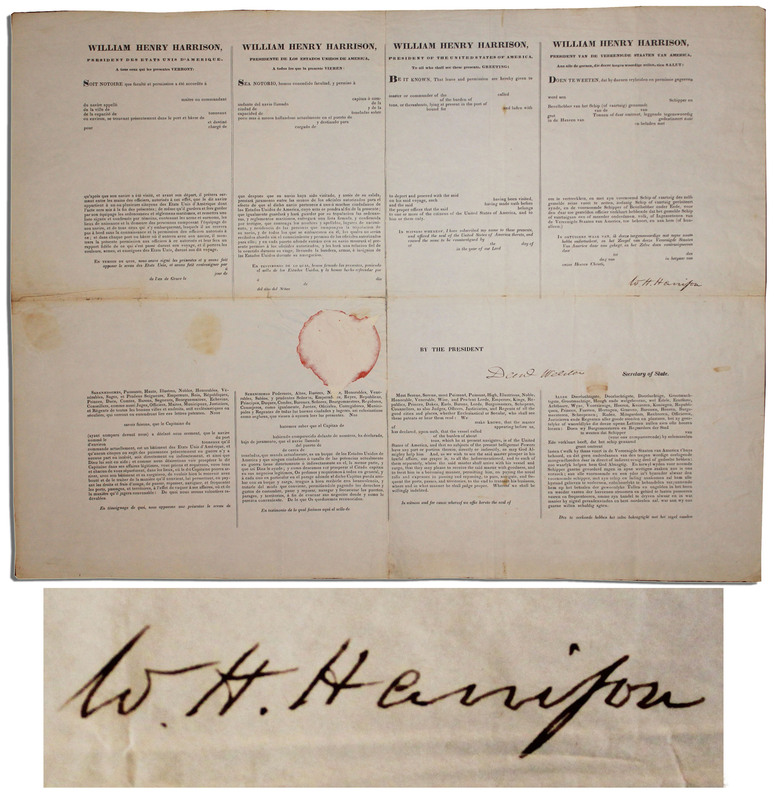 This William Henry Harrison Autograph Partial Document Signed as President sold for $59,742 at our auction in 2010. If you are looking to auction, buy, consign or sell a William Henry Harrison autograph signed as President, please email Nate@NateDSanders.com. View our current auction here.